I don’t know that I have ever had an ear infection. Somehow I’m blessed with having some sort of immunity to earaches. My husband was not so lucky; he constantly had ear infections and was put on all the meds (eventually becoming immune to many of them) and got quite familiar with his ear, nose, & throat doctor. Thankfully, he grew out of having ear infections around the time we got married. He has had one or two in the last 13 years that we’ve been married. 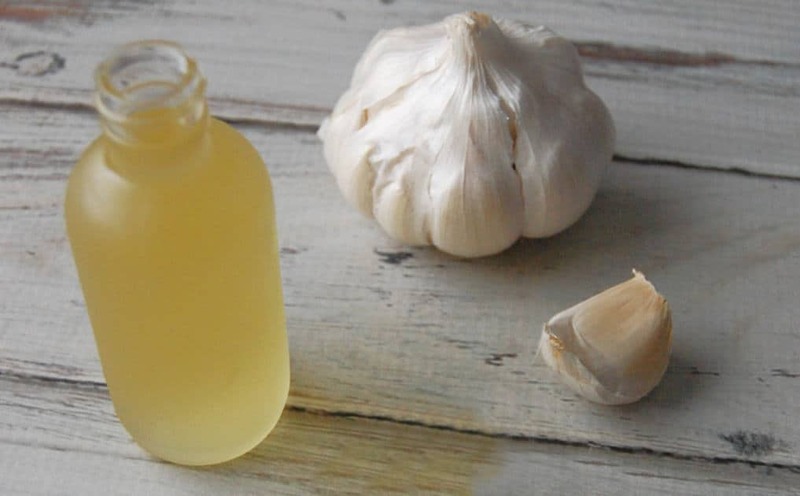 Once required a 3am trip to the store to buy painkillers (pre-natural living days) and the other meant I whipped up a batch of mullein garlic oil. Garlic oil? What does making a pungent oil that I could use for dipping bread in have to do with ear infections? 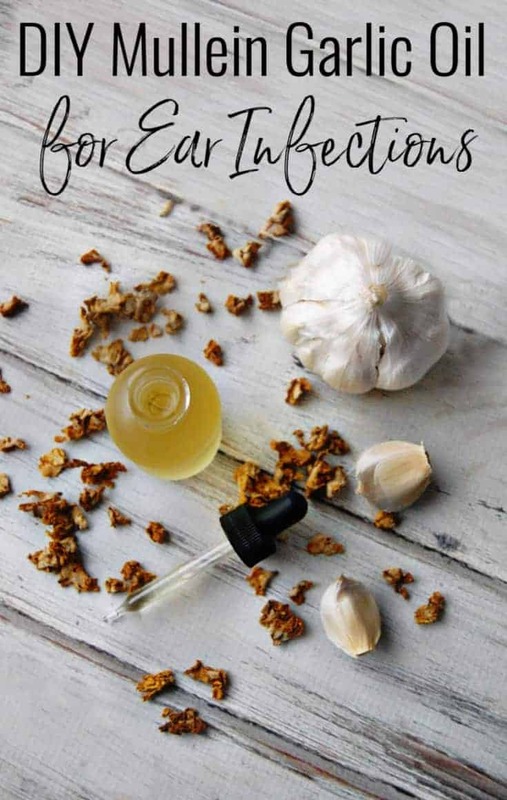 Garlic oil is one of those great home remedies for ear infections that crazy enough works like a charm! Better yet, you don’t have to buy any crazy ingredients because I bet you have garlic and oil in your kitchen! 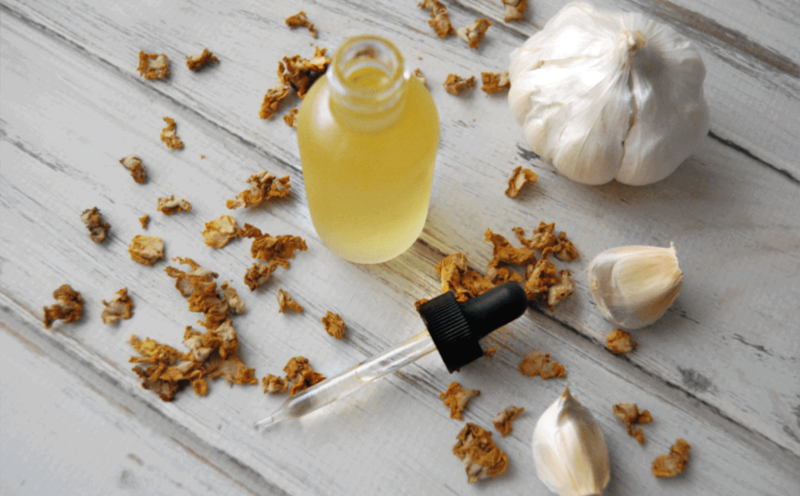 You’ll notice that this post is titled “DIY Mullein Garlic Oil” but just in case you don’t have mullein lying about at 3am… you can also make just garlic oil which works almost as well the mullein just gives the remedy an extra boost. But first, let’s go over why you wouldn’t want to just pick up meds from the doctor. Antibiotics are commonly prescribed for ear infections but most earaches are caused by viruses. Antibiotics do not work on viruses. Taking antibiotics more often than needed can harm gut health and build up an immunity to antibiotics leaving you with fewer options for when you really do need them. Most ear infections clear up on their own within 1-3 days without any intervention. But even if an ear infection clears up in a few days that doesn’t mean it’s pain free which is why many turn to painkillers like acetaminophen … but painkillers come with their own issues. If used for reducing a fever, acetaminophen can actually elongate the healing process. Fevers have their purpose and should only be reduced when absolutely necessary. You can learn more in my post: Fevers: friend or foe. Acetaminophen has been shown to increase risk of asthma and allergies in children. What is a natural minded person to do with trying to deal with an ear infection? Sometimes you just don’t want to pay so much for a remedy that you only use once in a blue moon. I’ve only had to use mullein garlic oil maybe a handful of times in the last decade and that’s with a husband and 5 kids! 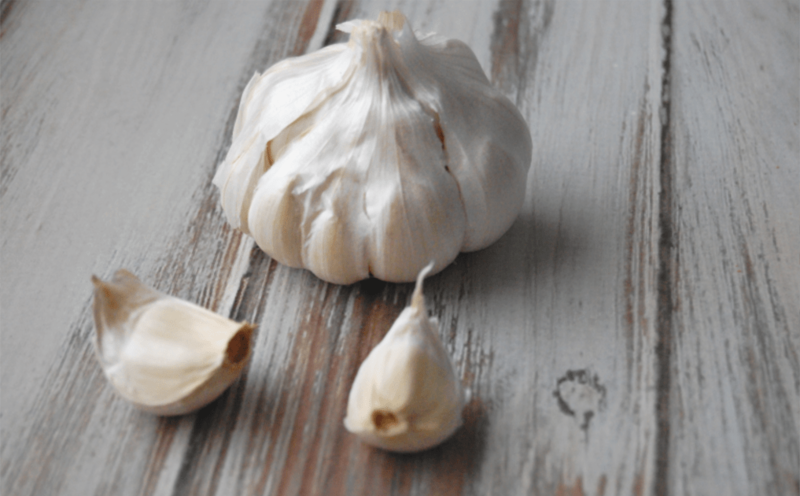 Garlic is more that just a tasty ingredient in food. Garlic is antimicrobial which means it can fight against ear infections whether caused from viruses or bacteria! What If I Don’t Have Mullein? No mullein? No problem! Just make garlic oil. Of course, mullein is a very helpful ingredient to include but even if you have to leave it out, garlic oil still does an amazing job of dealing with earaches! If ruptured or perforated ear drums is a common concern in your home then you might want to pick up this otoscope so you can check things out yourself before putting any remedies in the ear. Mullein Garlic Oil also doesn’t work for swimmer’s ear. Sorry. Place mullein and garlic into a small jar and cover with enough olive oil so that everything is submerged. Cover with a piece of muslin and let infused in a dark, warm spot for 2-3 weeks. Make sure to check on the oil occasionally to make sure that everything is still submerged. After the 2-3 weeks are over, strain through muslin or coffee filter. Store in a clean bottle with dropper in the refrigerator. Place mullein and garlic into a small mason jar and cover with enough olive oil so that everything is submerged. Heat over a simmer for 20-30 minutes. Strain through muslin or coffee filter and allow to cool to room temperature before using. Have the person with the ear infection lay with offending ear up. Place 2-4 room temperature drops of oil into the ear. Have the person lay with their ear up for 5 minutes. Lavender oil around the outside of the ear can help with pain and inflammation as well. Lavender oil is one of the only oils you can use undiluted but to be safe you may want to dilute 1 drop of lavender essential oil in 1 drop of olive oil (or any carrier oil). Lavender is also safe for kids! Read here for more about essential oil safety. A warm rice bag can also bring relief when dealing with ear infection pain. This Crazy Maze has a great post on how to use acupressure for earaches! I have lots of sinus problems, which turns into ear infections….I just learned about garlic in the ear, all I had was oive oil and garlic, so I used it and it amazed me how well it worked, I also took oregano oil with avacado oil internally for the sinus infection….I am learning…slowly…mullein is new to me…..thanks for the article. 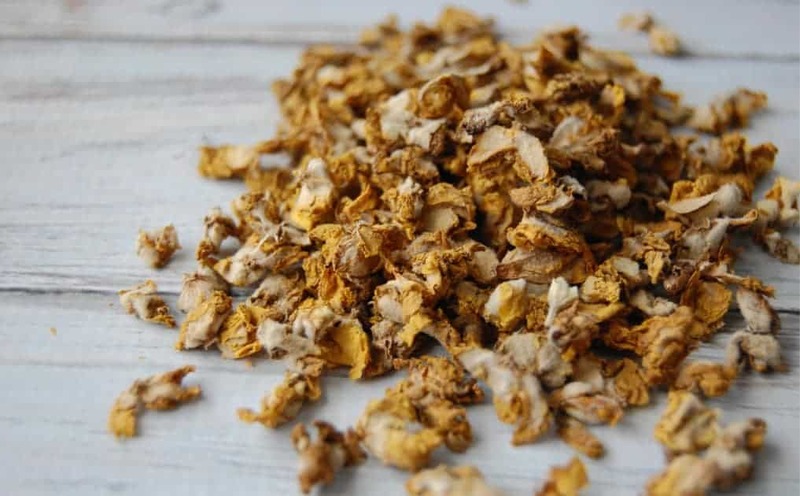 Do you have any recommendations about using Mullein with lung infections? I’ve read that people nebulize it. I used a coop store bought version of this today on one of my kiddos! And grew up on on it as a child as well! Thanks for the recipe itself, I’ve been planning on my making my own once the store bought bottle is gone! I have mullein leaf, not the flower. Can I use that instead? And if yes, would you think the same amount? I have not tried it with mullein leaf. From what I’ve read, it’s the flower that is helpful for pain relief and the leaf helps more with respiratory issues. Such a great natural remedy! Thank you! I’ve used the store bought version, but I look forward to making yours! !